5. Ken Tran from Kaplan pointed me to the GMAT community homepage, where testers can preview all of Kaplan’s free resources. My favorite is the free practice test. Unlike many free practice tests, Kaplan tries to simulate test-day conditions with an actual proctored exam. If you enroll in the paid course, you can even take your practice exam at the real test center, an awesome feature that is unique to Kaplan as far as I can tell. 4. 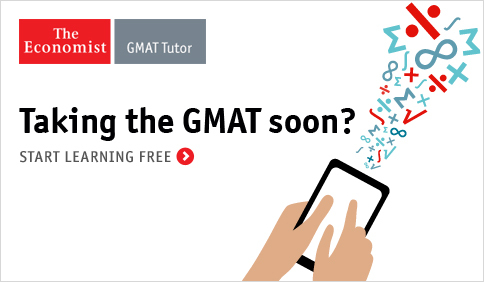 Economist’s adaptive GMAT preparation, best-in-class score guarantee, and included one-on-one tutoring make the paid version an incredible value. They also offer a free trial version. The Economist will let you try their course for 7 days, take a practice exam, and schedule a one-on-one tutoring sessions all for free. 3. Veritas Prep’s Mobile App: The first of two mobile apps on this list, Veritas Prep’s prep app is free on the app store. The app, actually designed to accompany the paid course, still allows you to stream all (yes I mean ALL) of Veritas’s course videos without parting with a single penny. Veritas’s video instructors keep it interesting with light candor while they radiate some of industry’s best instruction and most practical tips, making Veritas Prep the highest rated course on BeatTheGMAT.com. 2. Our second app was design to be free. So unlike Veritas Prep, there is no referring back to paid material you do not have access to. Prep4GMAT recently redesigned their app and what a difference it made. The new app is user friendly and allows for easy progress tracking and weakness identifying. 1. The holy grail of free GMAT offers 500 videos including 35 hours of expert GMAT instruction. Unlike most GMAT prep courses, which use made-up questions, GMAT Prep Now use questions directly out of the Official Guide. This guarantees that you are not wasting time with questions you will not see on the test and also gives you confidence in the level of difficulty of the practice questions. Brent Hanneson from GMAT prep now did not say why they started offering the course for free when contacted for this post; however, their website says, “our biggest reason is that we’re proud of our course.” Whatever that means…I don’t get it. All I know is you now have access to hours of high-quality content for FREE!